Adjustment screw regulates distance of throw for spacing 11" to 15" apart. 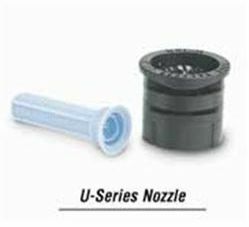 Matched flow rate nozzle assures uniform watering when different patterns are mixed on the same circuit. Mounts above ground on a riser tall enough to clear shrubs and tall planting.